This was an AWESOME breakfast-for-dinner meal. I make omelets all the time but have always hesitated to include meat in them. Side-by-side with roasted potatoes and some of the best toasted bread on the planet, my natural food sense was blown away. The only somewhat-expensive item pictured was the bacon, which cost $6 for 12 ounces, but could easily have fed 4 people. Organic pepper jack cheese does cost a bit more than standard pepper jack cheese, but is worth the bump in fee. Check out the Flickr photo page for a larger image version. 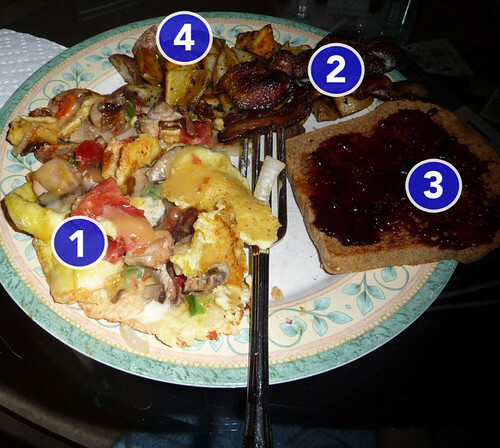 (1) Semi-omelet includes grazing-fresh eggs, organic pepper jack cheese (purchased at Foods For Living), roma tomatoes from Owosso Organics, jalapeno pepper from Owosso Organics, and organic mushroom from Meijer. (2) Natural thick-sliced bacon purchased at Foods For Living. Vegetarian-fed, humanely-raised pigs from an Iowa farm. No nitrates added! Brand name escapes me right now. (3) Honey whole wheat bread purchased from Great Harvest Bread company (Okemos, Michigan), with a little bit of real butter and natural blackberry jam. (4) Seasoned roasted organic potatoes (mixed varieties) from a farm in Dewitt, Michigan.